I was a little apprehensive about it. I wasn’t sure how people would react to an eight year old tagging along. I might be the clichéd oversharing proud dad (look – endless photos! ), but I still have the tiniest bit of self-awareness left to (sometimes) realise that not everyone is as fascinated in every little thing my kids do as I am. I know people, particularly people who don’t have kids, might not relish the thought of spending a weekend with children running around. I wondered if it would make people uncomfortable. For example, I was relaxed about the chance that she might hear the occasional swear word. (I don’t swear in front of her, and she knows I wouldn’t want her to swear. But we’ve talked about it, I know which swear words that she knows, and she knows why I don’t think she should use them. So I wasn’t worried that she’d be mentally scarred for life if someone used a swear word or two in any of the sessions that we’d go to.). I wasn’t expecting anyone to change their talk or feel that they had to censor themselves just because I’d chosen to bring a child. But what if people assumed I did have those sorts of expectations, or resented having kids around because of it? Or what if…? Basically, I was doing lots of second guessing about what people might think or do. But, I thought she might enjoy it and wanted to share with her what I’ve gotten out of barcamps, so decided to give it a try. It was great. I’d worried about nothing. In fact, I probably shouldn’t have left it so long to bring her to one. Everyone was absolutely lovely and welcoming to her. The talks we went to exposed her to ideas and perspectives that were genuinely new to her, that she questioned me about for the whole drive home. It gave her a chance to see and try cool things that were new to her, like 3D printing, Makey Makey, an Aibo, and an Oculus Rift (seriously impressive virtual reality headset). And she even agreed to do a talk herself. She’d never used presentation software before, so I gave her a crash course in how to use Keynote on the iPad to make herself some slides. I wasn’t sure she’d do it. She was terrified about doing it, and for the few minutes leading up to the start, I think she’d have happily ran out of the room. But she did it. For half an hour, she ran a session about the computing that gets taught in her primary school, covering stuff like what hardware and software they use, and what skills they are taught. She did great. I was very proud. And it was lovely to see the sort of reaction that she got. Being blown away at #BCB13 by young girl giving talk. Room is packed! Grace Lane, 8 years old, leading a #bcb13 session on computing in schools. About 40 people listening and discussing. Wow! An awesome talk just now at #bcb13 on ICT teaching from the point of view of an 8 year old. We had a great time. 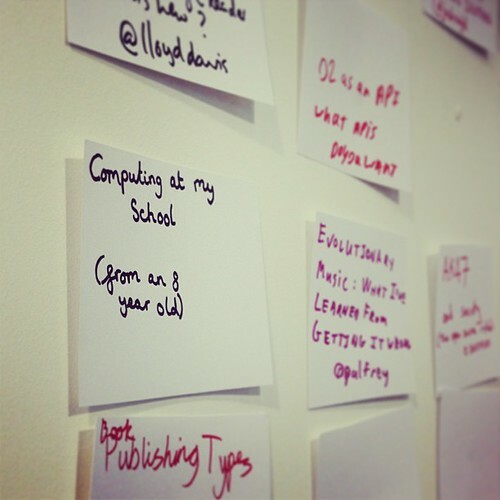 Taking a kid to a barcamp ended up being a great idea, and she can’t wait to go again. The only downside is that soon Faith will be old enough to come along, too, and then we should all be afraid. This entry was posted on Monday, June 17th, 2013 at 12:23 am and is filed under kids. You can follow any responses to this entry through the RSS 2.0 feed. Both comments and pings are currently closed. It really was a wonderful talk carried off with aplomb. I’ve previously been quit anti having kids at BarCamps. Usually because parents drag them along to sessions that the parent is interested in and the kid is bored out of their mind. That’s often quite disruptive. How refreshing to see a kid who is articulate enough to present to a crowd of strangers, and quite willing to listen to the mad ramblings of others. Will have to see if it’s possible to make future events even more welcoming for young people. Hopefully see you & your family at OTA? Glad to see that it went so well and I look forward to the talks from Grace and Faith next time. I enjoyed reading about Grace’s achievement. I hope she gets more opportunities like that. So many professional women I know are very reluctant to speak in public and so are not as well known as male counterparts, and I think that starting to do it at a very early age must help build the confidence to do it as an adult. I’ve never used Keynote myself (yet), but was interested that she was able to learn how to use presentation software & produce something in a short time. She sounds impressive! I was so impressed. She didn’t seem nervous to me. When I got nervous as a kid, my voice would wobble and I would shake. My mind is boggling about how much the world will change when this generation of youngsters become adults, managers, designers, developers and politicians. Compare their exposure to technology and its possibilities with my first getting access to computing at age 20 at uni. Grace was a professional! And like all professionals, a short attack of nerves is completely normal. Once you get over that, things just flow. It may take just one second, or ten, or thirty. We all get it! Having seen Grace in action she had the determination to get past that first hurdle, and she gave a thoughtful and coherent presentation with aplomb. And Grace handled the Q&A like a pro! Thank you all for the kind comments – much appreciated. And Grace was thrilled that so many people gave such lovely feedback.